Milan, 21st February 2018 – Monica Freire, Congress Department Director of AIM Group International - Lisbon Office, has been elected to the new Council of IAPCO (The International Association of Professional Congress Organisers). IAPCO, with 118 company members across 41 countries, represents the best qualified professional organisers in the world with the mission to raise the standards of service by means of continuing education and interaction with other professionals. The work of the Council, members of which have a 2-year term, is to administer the Association, to ensure that the quality standards as set are maintained, to serve the members and to guide IAPCO as the leading authority on professional congress organisation worldwide. Furthermore, the Council is responsible for ensuring that IAPCO fulfils its responsibilities in accordance with its statutes in a professional manner and operates in a business-like and is financially viable. AIM Group International, a leader in organising meetings, congresses and events, has a long history of active engagement of its professionals in international industry associations, and particularly IAPCO, where Patrizia Semprebene Buongiorno, vice president AIM Group, has held, in the past, the role of President. 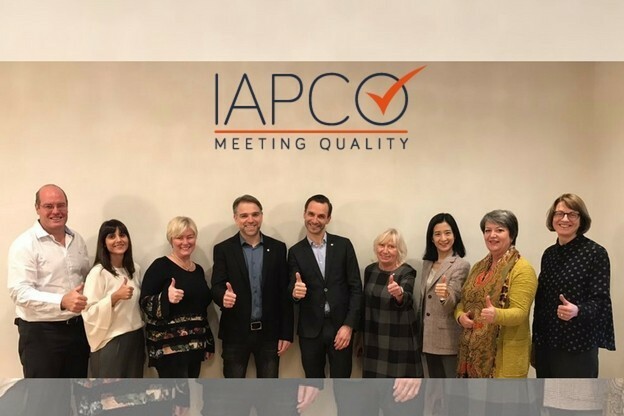 “I am very honoured to have been elected as Council member of IAPCO,” says Monica Freire (in the picture above, the second from the left), elected at the IAPCO General Assembly in Tokyo that experienced a record-breaking attendance of more than 100 members. “As a representative of an international company it is an added honour to serve as a council member and to continue AIM Group’s dedication and close collaboration that we have witnessed over the years with the association”. “I strongly believe in the vision of the new Council of strengthening the relationship with members, continuing the focus on education, improving internal communication and enhancing the international vocation by widening the reach of IAPCO around the world” she adds. Monica Freire joined AIM Group International in 2010 and has been heading the Congress Department in Lisbon since 2012, dedicating her time to establishing the Lisbon Office as one of the major players in the local industry as well as growing its presence internationally. Starting her career in the congress industry in 2001, she has developed her skills as a congress and corporate events manager as a PCO and in the Pharma Industry. She has been involved in the bidding, planning and onsite coordination of both national and international conferences. With a strong passion for continuous education and networking, Monica is an active member of IAPCO, representing the Lisbon office in this Association, since 2010 and she was directly involved in the bidding and organisation of the IAPCO General Assembly held in Lisbon in 2015.